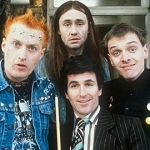 The Young Ones is a Sitcom programme that first aired in 1982 and has been classified a 15 certificate. This strange and very surreal British sitcom from the early 1980s followed the student lives of four very mis-matched university students. 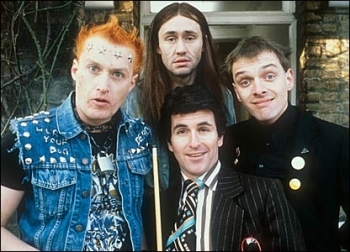 Set in a squalid house in North London, the students included Rik (Rik Mayall), a wanna-be anarchist who studied sociology. Then there was Neil (Nigel Planer), a raving hippy who never slept. Mike (Christopher Ryan) was allegedly the Cool Woman Magnet and was slightly more sensible than the rest of them. Meanwhile, Vyvyan (Adrian Edmondson) was a punk-rocker medical student, prone to extreme violence and vandalism. Together, the eternal students kicked the hell out of each other in two series of 12 episodes. Written by Ben Elton, Rik Mayall and Lise Mayer, the loosely structured episodes found time to introduce guest bands and menaces from Russian landlord Jerzy Balowski (Alexei Sayle).